When we talk about the construction of Walt Disney World, we often think of swathes of swampland being transformed into magical lands and magnificent resorts. Occasionally, we may allow our minds to wander over to the Gulf Coast and inevitably Tampa Shipyards where the Nautiluses were constructed and engines of the Walt Disney World Railroad were given new lives. 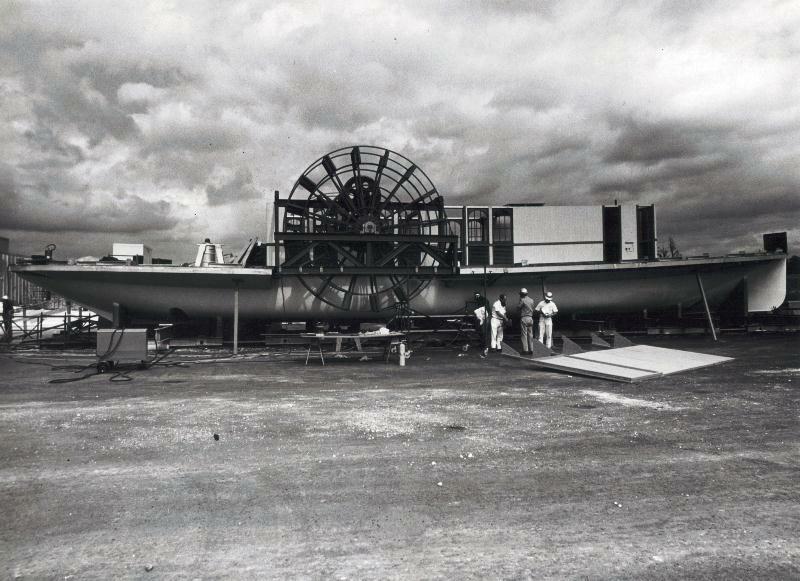 Yet, Tampa Ship was not the only, or original, site for Walt Disney World vehicle construction. Morgan Yacht not only began the process of fabricating the submarines for 20,000 Leagues Under the Sea Submarine Voyage, they also set work assembling over 100 other watercraft that would eventually fill the various bodies of water around Walt Disney World. Morgan Yacht, based in St. Petersburg, FL, was the handiwork of Charley Morgan who had designed the Heritage, a vessel which was raced by Charley during the America’s Cup. Back to the Walt Disney World connection, among the various watercrafts constructed at Morgan Yacht there were a pair of side-wheel paddlewheels. One of which can be seen during its assembly below. Though the paddlewheels are not still sailing around the Seven Seas Lagoon or Bay Lake, they had an incredibly storied history at the Vacation Kingdom. Anything I could tell you about them, however, would pale into comparison to what has already been penned by FoxxFur at Passport to Dreams. To continue the tale of the side paddlewheels, be sure to head on over and read The World Cruise.